This website is currently not updated with new artwork while a brand new shiny one is made - prices and contact methods are all still up to date and relevant via this website. 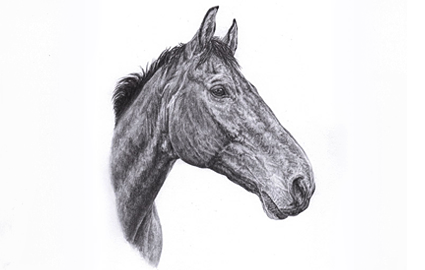 For recent artwork (both equine & pet portraits) and all the latest news, head over to the Facebook art page for now - any queries, don't hesitate to ask! 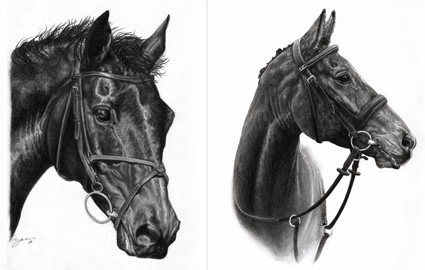 Welcome to the studio of equestrian & pet artist, Emily Mayman. 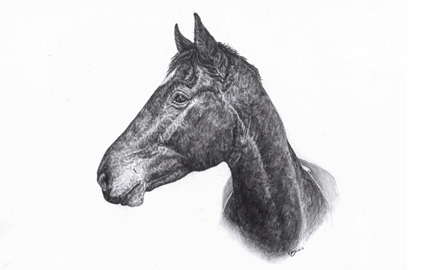 A professional graphite artist based in the UK who understands the importance of commissioned artwork looking like your own horse or pet, not just a nice picture. Commissioned artwork makes excellent gifts for Christmas, Anniversaries, Birthdays, as tributes or just a treat to yourself or a friend. Not got a pet in mind? No problem - commissions can range from 'a Friesian on a beach', 'a Labrador in water' to Unicorns - prices are the same as specific pet commissions. Pets and animals of all kinds are also undertaken, most commonly dogs, birds, cats and rabbits. Originals and limited edition prints are also often available for sale. For tips on taking photographs, see the handy photograph guide. Thank you so much. I will most definitely be recommending you and it will have prime position in my room!!! Just to say I got home yesterday and got the drawing. Its so amazing! I can't quite believe how similar it looks to the picture! Thank you so much once again! 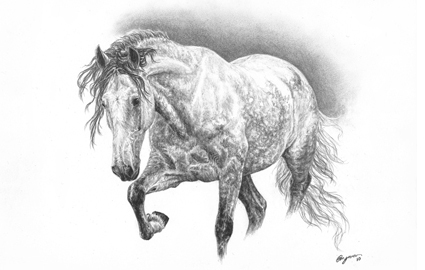 "Emily Mayman's custom commission portraits not only look just like your horse but she seems to capture the character and spirit of the horses she draws. I am very pleased one of her wonderful drawings is featured in "HORSE SAYINGS: wit & wisdom straight from the horse's mouth"